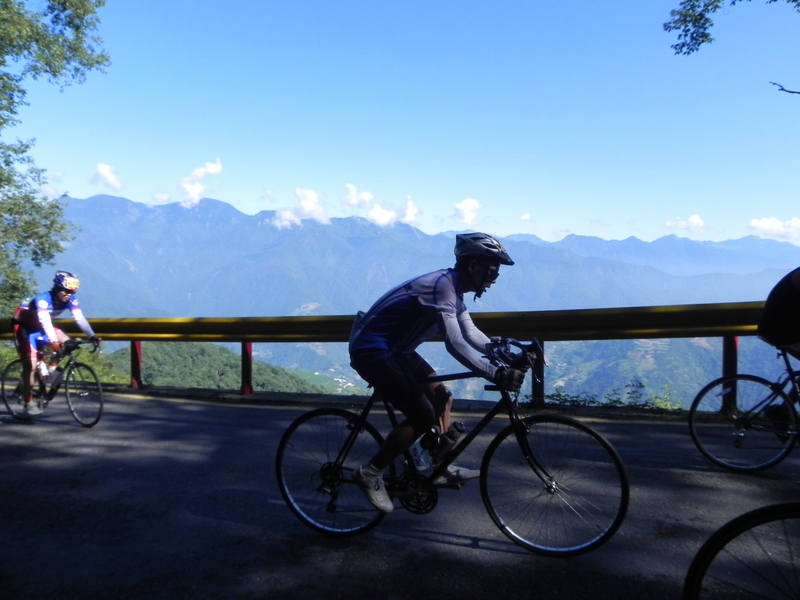 This year’s Never Stop永不放棄 challenge ride from Puli to Wuling (武嶺) at 3275m was the most popular ever. 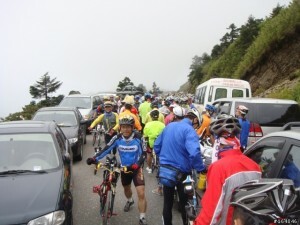 Somewhere in the order of 6700 cyclists and their support headed towards the pass beginning 5am Sunday. 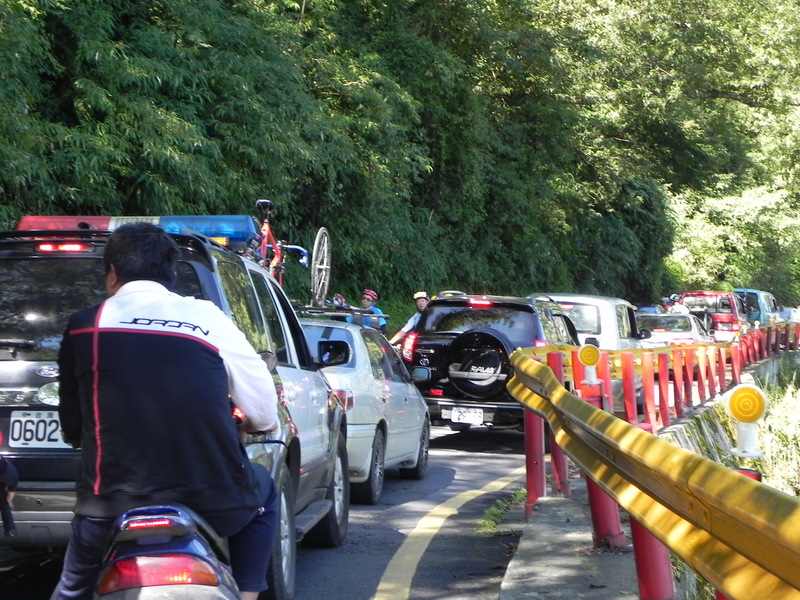 To get a better idea of what the climb is about, checkout this post from the 2010 edition of this event and the 2010 National Cycling Club version here. This year also included a good number of Triathlon contestants who rode up as part of a continuing series of competitions. I was out on the mountain walking a 2-3km stretch of the road where the altitude goes through 2600m trying to find some good angles to capture the action. 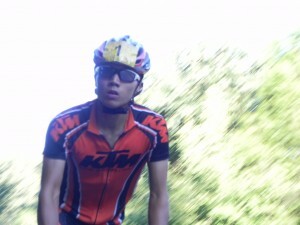 As usual, the first one up the mountain was Lin Huan-Zhe. He’s here every year and is the acknowledged KOM for the Wuling climb. Not all that far behind was his team mate. The racers are up and finished long before the rest of the field start to trickle up. The day really belongs to the non-racers for whom the mountain is really a monumental challenge. Most cyclists tackle the mountain in groups and just take their time, stopping at the rest stations which included hot soup at the 2600m level. The day was sunny early on but temperatures drop quickly as you climb so there’s nothing quite like a bowl or three! of soup to replenish motivation to tackle the most difficult sections that lie ahead. Many climb strongly and in style. It’s always best to be in front of the main pack because once you get to the narrow sections on the last 15km it is often impossible to ride due to the crowd. He is the first of many to start feeling the altitude and the unrelenting grade. This year was the most poorly managed in terms of traffic. 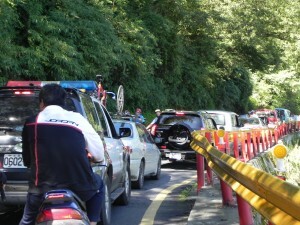 From mid-morning onwards, the road became a car-park which was quite a disappointment for many. Later in the day many could only finish the event by walking all the way up, not a way most would have envisaged their ride to end. It’s a good day if you are in your group and just take it in the spirit of a “hike” up the mountain rather than a race—good times shared by all. 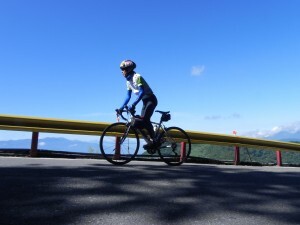 But the challenge of this ride itself is better enjoyed on a weekday, or very early on any weekend of the year except this one, and except the very cold days through winter when there will be ice and snow on top. I was happy to see quite a few of your guys up on the mountain. I chatted them up on the lower sections before letting them get back down to business. I hear that traffic control was terrible. After 10:00am it was a free for all. And they all made it, except one. I saw you go past and just missed getting a shot, I got a shot of your back! Congratulations getting there in 4:14! Thanks! This time it was just about being healthy. I have a couple blurry, bike-top pictures of your guys in blue and a girl in pink. Too bad they didn’t turn out. How did Glenn do? I kept seeing him on his training route. I had trouble with blurry photos myself. It was not a good day on the photo side of things. Glenn got to 翠峰 and had altitude effect quite badly. His goal was a PB and realized he could not make his time so went back down to recover.